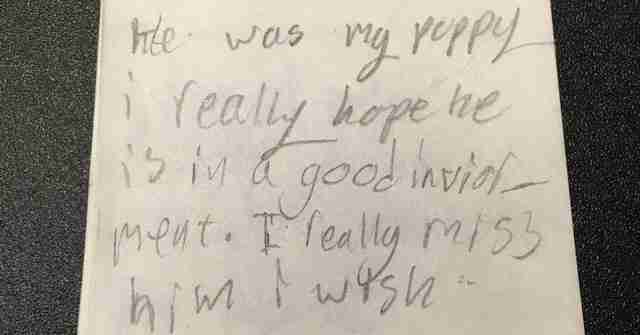 "Please tell Rhino that I love and miss him every night." When dogs or cats are adopted from shelters, they're hopefully going to their forever home. But sometimes, for whatever reason, it doesn't work out. Last September, a family with four young kids adopted Rhino Lightning, a 3-year-old brindle boxer mix, from the Humane Society of Utah. Rhino Lightning (Rhino for short) lived with the family for several months, but last week, they brought him back. "They felt that he was a little too rambunctious with their small children," Deann Shepherd, director of marketing and communications for the Humane Society of Utah, told The Dodo. "Sometimes a family is just not in a position to provide the care the animal needs." Returning Rhino wasn't an easy decision for the family, Shepherd said, especially for the family's youngest daughter. 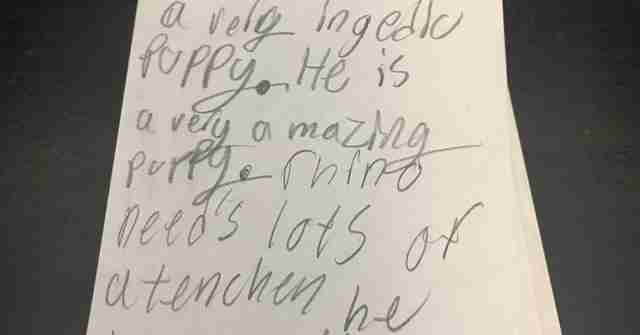 When the family dropped off Rhino, they gave the shelter staff a tiny, spiral-bound notebook that the little girl had written in. 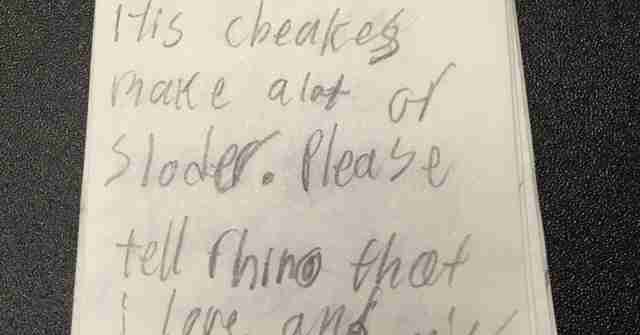 "Hi, if you are reading this, you must own Rhino now," the little girl wrote in the notebook. "He was my puppy. I really hope he is in a good environment. I really miss him. I wish he knew that he was a pretty puppy." 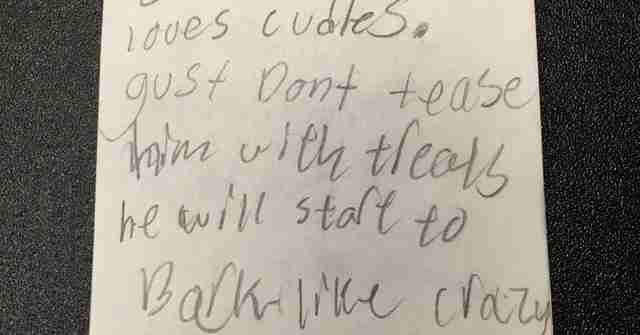 The girl gives Rhino's new family specific instructions. For instance, she tells them they must take him on two or three runs each day, bathe him once a month and, of course, give him lots of attention. "Rhino is a really intelligent puppy," she wrote. "He is a very amazing puppy. Rhino needs lots of attention. He loves people. 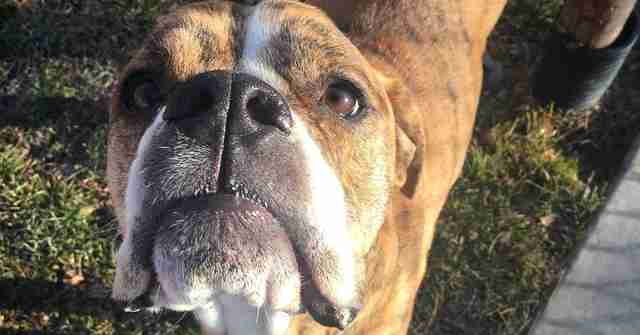 "Rhino is a good dog and he loves cuddles. Just don't tease him with treats - he will start to bark like crazy, then you have to just try and calm him." "He likes sleeping under blankets. Rhino also hates kennels. Sometimes he gets really happy and runs around you." One thing the girl is very particular about is Rhino's name. 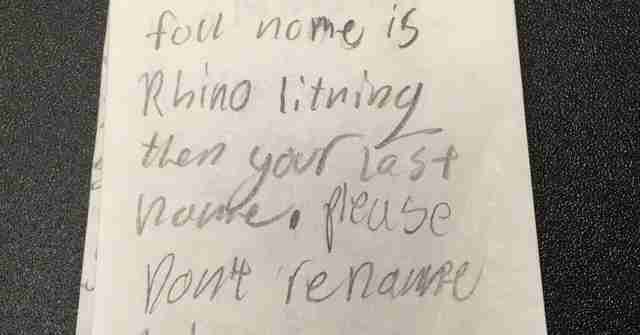 "His full name is Rhino Lightning, then your last name," the girl wrote. "Please don't rename him." What's even clearer than her instructions is the fact that she loves Rhino - very much. "Rhino is a striped dream," she wrote. "His cheeks make a lot of slobber. Please tell Rhino that I love and miss him every night. While it's sad that Rhino was separated from this girl who loved him so much, the story has a happy ending. Rhino was only at the shelter for a weekend before being adopted by another family. This family had kids, too, but the kids were older, and the shelter staff thought they'd be able to better handle Rhino's energetic nature. What's more, Rhino's new family promised to follow the little girl's suggestions. 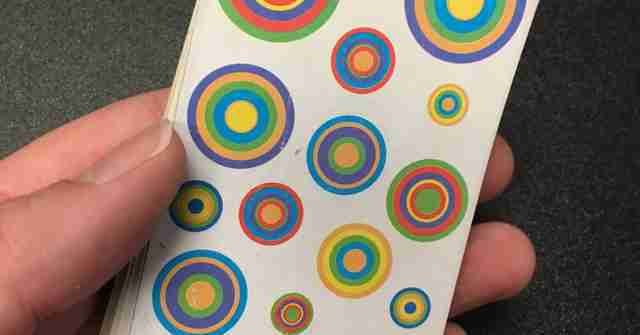 "The family did take the notebook, and they are going to try and abide by the guidelines that the girl set out," Shepherd said. "They're going to keep his name Rhino Lightning. They're going to make sure they give him a bath and daily runs and everything that she said. It's really cute." Rhino was lucky enough to be adopted a second time, but there are plenty of other animals at the Humane Society of Utah up for adoption. You can also support the organization's work by making a donation.